The number of complaints received by Ofcom about pay TV providers has risen, according to latest data. In its latest quarterly stats briefing, covering the 3rd quarter of 2017, Ofcom confirmed an increase in complaints received about pay TV services, following a substantial dip reported three months earlier. Once again, BT is named the most complained about provider of pay TV services. The YouView-based TV platform contains a hybrid of terrestrial and internet-delivered content. 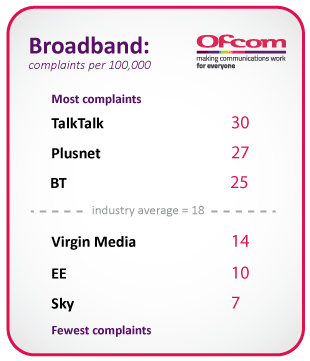 Ofcom received an average of 14 complaints per 100,000 subscribers about BT TV. 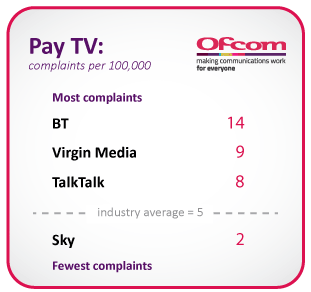 In contrast, only 2 complaints per 100,000 were received about Sky TV's service. However, despite coming top, complaints about BT TV have dropped - in 2016, Ofcom was receiving 20 complaints per 100,000 subscribers. 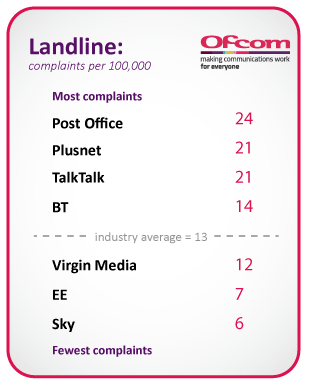 Virgin Media was the second most complained about service, with TalkTalk TV narrowly put in third place. 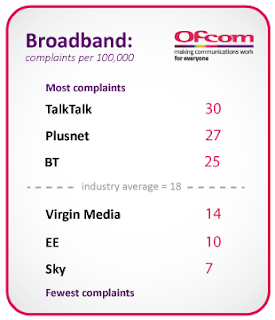 TalkTalk's fixed line broadband service - which is required to receive TalkTalk's TV service (also based on YouView) - was the most complained about, followed by broadband services from Plusnet and BT. Sky's broadband service was the least complained about. EE has gone from being the most complained about fixed line broadband service to second least complained about, with just 10 complaints per 100,000, compared to 34 per 100,000 in 2015. All the stats are listed below. Hidden from the stats are all those complaints which were never escalated to Ofcom. Users who want to complain to Ofcom about a poor telecoms service are advised to call 0300 123 3333 or 020 7981 3040, or if you want to complain in Welsh call 0300 123 2023 or 020 7981 3042. Ofcom is open Monday to Friday from 9:00am to 5:00pm.